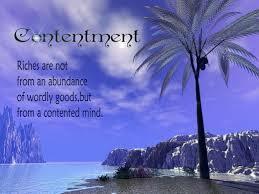 Thoughts from Brahma Kumaris: True contentment brings contentment to others as much as to the self. True contentment brings contentment to others as much as to the self. Projection: When we have to do something, we usually do it the way we like. We don't bother about others and only see if we are happy about it. So we find that others are not content with us although we are happy with what we are doing. Solution: Our actions need to be such that they do not cause sorrow to anyone so we need to check our actions and change them. When we do something in the right way others will be content with us as much as we are. When we look at ourselves from outside we can only see the surface of what we have become. We can't see or perhaps cannot even imagine the inner core (center), which, like in the example of the coconut, is the only part that really can nourish us and give us energy. The shell (in the case of the coconut) serves as a protection but we certainly can't eat it. In our case, the core (center) consists of natural or inner qualities such as peace, love, power, truth, happiness and so on. The shell is the ego which consists of features or personality characteristics we have acquired through the journey of our lives such as experiences, abilities, memories, learning, habits and beliefs – in short, all that we are referring to when we say: 'I am so-and-so, from such-and-such family or organization or city'.